There’s been a number of great hard rock records in the last few years but every so often, you need a band to come along and say “This is how it’s done”. And who better equipped for the task than Slash featuring Myles Kennedy and the Conspirators? Four years on from World on Fire, Living the Dream shows they’re as potent as ever. Opening track “The Call of the Wild” doesn’t just provide you with a riff which points to classic Slash. Before Myles Kennedy’s instantly recognisable vocals kick in, they’re showing you that as an entire unit, they’ve got their own sound – this is classic Conspirators. But this track does more than that, the band want to show that whilst they’ve all been working with individual musical projects, this has not only been worth the wait, the magic and chemistry of this band is still there. Naturally, the draw for the album is the man with the Les Paul but Slash has surrounded himself with some incredible musicians to make up the rest of the band that it’s not solely about him. Brent Fitz’s signature drumming has its hooks in you from the start – if you’ve heard Apocalyptic Love and World on Fire, you know it can only be him. Opting for his standard “less is more” approach to show you don’t need a massive kit, it’s well finessed and adding so much character to the songs, it’s no wonder why he’s been a man in demand for the best part of the last two decades. Meanwhile, Todd Kerns’ bass work is an ever-present force; thick lines thrum alongside the guitars to the point where it slaps you in the face on “Slow Grind”. Providing backing vocals once again, they’re punchy, sharp and measured and since he can more than do justice for “Dr Alibi” (originally sang by Lemmy on Slash’s self-titled album) at live shows, you have to wonder what a Conspirators track with him on lead would sound like. Then, there’s Frank Sidoris’ rhythm guitar work. Having been comfortably handling those parts since the Apocalyptic Love tour where he’s been playing guitars provided by the likes of Izzy Stradlin, Kennedy and Slash himself, here, he gets his own shot at it. And he nails it. Bouncing well off Slash’s leads and winding well around them at the same time, it’s something that can only come from working with a back catalogue like his and playing on stage for years. There’s no stopping with the first few tracks on the album, bubbling with intensity and all hooked together on Slash’s inimitable playing – there’s no mistaking that style for anyone. It’s the characteristic modernised craft he’s been plying for a number of years on his solo albums yet defined his entire career by. However, when “Lost Inside the Girl” begins, it doesn’t sound like a Conspirators song, it’s as if Slash has gone back a quarter of a century and looked to his early Snakepit days to give a sludgy riff you’d hear on It’s Five O’clock Somewhere and followed it with “Read Between the Lines” which could have come from Ain’t Life Grand. That said, it’s not all about harking back to his band with its cult following. “My Antidote” would have nestled itself well on the gargantuan World on Fire. Musically, it’s as vicious as anything found on the 2014 album, and the lyrics equal its decadent tone. Elsewhere lead single “Driving Rain” after its explosive opening riff drops half a step and is perfect to hear at a festival whether its raining or in the late evening sun. There’s even a call back to “Standing in the Sun”’s opening line to link the pair as if to re-examine the relationship six years later and show the dark turn it’s taken but reiterates the same theme – supporting those you love, no matter what. “The Great Pretender” has the band push into their more grandiose flavour. Whilst it’s not as ferocious and upbeat as “Anastasia”, it’s composed in the same complex vein. Throughout the album, Myles Kennedy’s vocals are as tight and polished as ever and it’s this song where he’s able to show everything his voice is capable of in one song between screams, hushed tones and sustained notes. With as long a career as his, he knows exactly what he can do and like Danny Bowes and Paul Rodgers, his is a voice which is only getting better with time. Slash’s guitar work is obviously the part which draws people in. It’s loaded with passion and the skill to back it up to prove why any corner of his work is still influencing young bands. Whilst he has experimented and played with styles over the years – it’s the blues-backed hard rock that he always comes back to, it’s what he knows best. Here, he’s having fun to make a record more diverse than its predecessor by looking at his previous bands. If Slash’s solo career proves anything, it’s how varied he can make himself yet retain the sound so many have tried to emulate since. You only have to look at his debut for proof of that. This is an album which takes the best parts of both Apocalyptic Love and World on Fire to make the quintessential Conspirators album. The over-saturated production found on the latter has been stripped back in favour of a warmer feel. And one of the most vital parts of this album is what it has in common with its predecessors – all dozen songs found here are made to be played for live audiences. 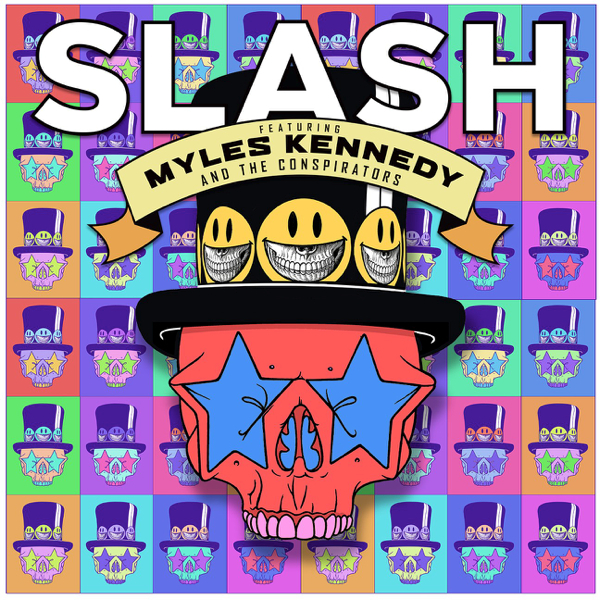 Slash has curated some of his best work to date with his trademark sound along with Myles Kennedy and the Conspirators never missing a step. There’s a chemistry baked into the record that can only be produced by these five men and indeed, Living the Dream shows that when surrounded by equally skilled musicians, the man in the top hat is an unstoppable force.